"Dijan the Ngawalil, that woomera, for spear and Jimbala sitting next to him on Darrajayin. He sitting up there, Dreamtime. He that rock. I should have painted three long rocks on top. Only one and short I put him! Jimbirla, that white stone, for spear you know?" The eagle Warranany, made these two on the side, and he said to his sister the crow Wangkarnal, “I’m tired and knocked up from making these jimbirla, you make him now”. The eagle chucked all the flakes at his sister because she wouldn’t do the work. That’s why that crow has white eyes, because his brother, the eagle, got wild at him. 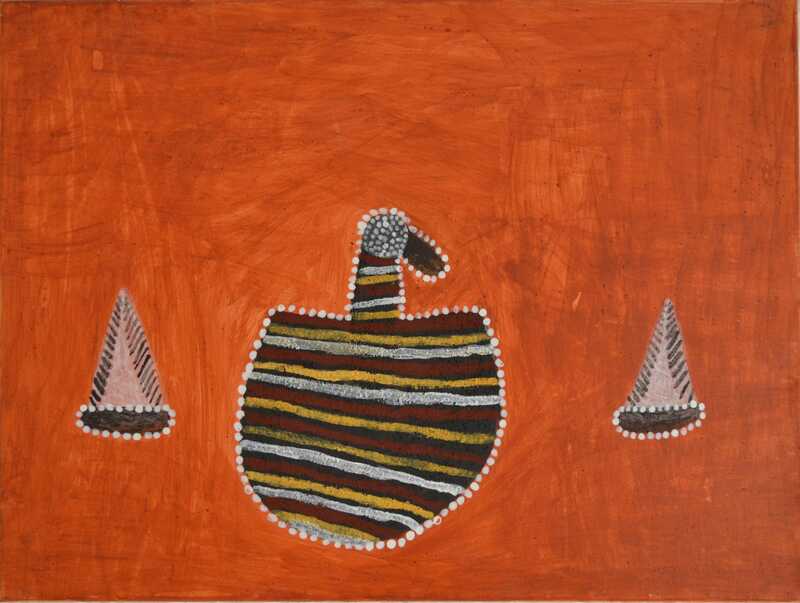 Mabel has painted the Ngawale (Woomera) Dreamtime site on her traditional country, Darrajayin. On top of the central rock is the woomera she is talking about. On Darrajayin you can go to this hill and see the woomera rock. Beside the hill are Jimbala (white quartz rock), which are used as spear heads.